Chairman Senate Muhammad Sadiq Sanjrani has said that economic cooperation among the regional countries is essential for prosperity and development of the region. Better parliamentary linkages would pave the way for cooperation in other sectors as the Parliaments not only play an active role for promoting the diplomacy but also enhancing the economic ties. He expressed these view while talking to Ambassador of Kazakhstan Barlybay Sadykov, here at Parliament House on Friday. Chairman Senate said that Pakistan and Kazakhstan has cordial relations at all levels from Parliaments and government to the people at large. He underlined that brotherly ties with Kazakhstan are the cornerstone of our foreign policy. He emphasized the need for further promotion and strengthening of parliamentary cooperation between Kazakhstan and Pakistan with primary focus on enhancement of inter-parliamentary engagements. 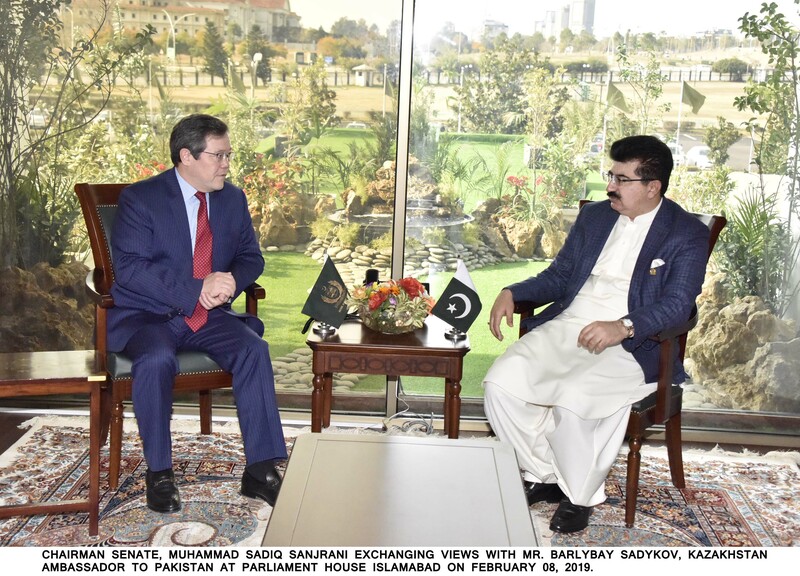 Sadiq Sanjrani said that Senate of Pakistan has Parliamentary Friendship Group for Kazakhstan and there is a need to enhance bilateral parliamentary relations through the forum of Friendship Group. He said that Pakistan and Kazakhstan has shared ideological and political stances on major issues of international concern, therefore, coordination between the parliaments of both the countries on the multilateral parliamentary forums of APA is very important. He said that the bilateral ties were further geared up during the visit of President of Kazakhstan to Pakistan in January 2018. He said that both the countries have interaction in areas of military education, training of Special Forces and military technical cooperation. The delegations from both the countries visited the defense exhibitions on reciprocal basis. Both the countries have also close interaction for learning from the each other’s experiences in efforts against countering the terrorism and have also conducted counter terrorism exercises jointly in Pakistan and Kazakhstan would host the forces from Pakistan for such exercises in 2019. Chairman Senate said that the cooperation between the two countries should be translated for strengthening the economic ties. The ambassador of Kazakhstan agreed with the views of the Senate Chairman and called for improved parliamentary linkages to steer further cooperation in different sectors.